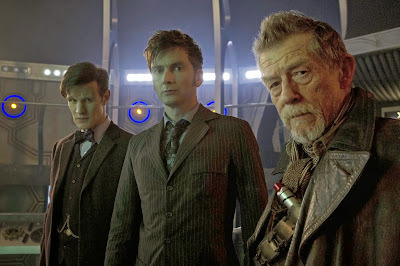 Over the weekend, Doctor Who celebrated 50 years in time and space with an anniversary special that follows in the grand tradition of previous birthday parties like The Three Doctors, The Five Doctors and, er, Dimensions In Time, in an adventure that teams Eleventh Doctor Matt Smith up with his predecessors David Tennant and... John Hurt? Yes, following the contractual-credit-tastic cliffhanger of the previous series finale, the Doctor's greatest secret, a lost incarnation of whom he has never spoken, has come to light. In The Day of the Doctor, the Eleventh Doctor and Clara continue on their travels, they're summoned by their friends at UNIT to investigate a 3D painting in the National Gallery, depicting the darkest day of the Doctor's life. Just as the Tenth Doctor gets entangled in matters from foiling a Zygon plot in the 16th century, so his rogue incarnation is brought forward to the present, as all three Doctors are set on a course to relive that terrible day. Busy plots have become the standard during Steven Moffat's run as showrunner on Doctor Who, but impressively, the special also manages to be lots of different things at once. I wouldn't go so far as to call it a movie, even if its scale and production value are on a scale unprecedented in the last half-century, (and certainly not before 2005). After the recent series of one-shot episodes, (reviews of those coming soon, I promise) the 75 minute episode seems glacially paced by comparison, but even with as much lip service as it pays to continuity, it's still tremendous fun. Obviously the main attraction is to see Tennant and Smith playing off against each other, with chemistry that has been described as "Laurel and Laurel, because Oliver Hardy hasn't shown up." 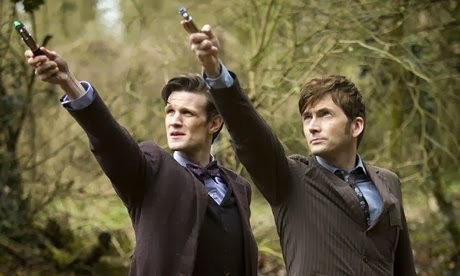 Tennant comfortably slips back into his most popular rendition of the character, while Smith gives as good as he gets, and never lets his counterpart steal the show. In the meantime, John Hurt pretty much walks away with the whole thing- grumpier than Christopher Eccleston's Doctor, more tormented than Hartnell's and yet altogether cheekier than expected. For his character, the episode is essentially a riff on It's A Wonderful Life, but with much higher stakes. By way of a lengthy introduction, we see his Doctor borrow a Time Lord superweapon called The Moment, with the aim of ending the Time War by destroying both sides. The Moment, mistakenly thinking that he's already met Rose, decides to look like Billie Piper and take him on a voyage to see what his future will be like if he goes through with this genocide. He then openly mocks all of the little tropes that the most recent Doctors have cultivated- the smooching, the pointing of screwdrivers, the childish lingo- he's such a fantastic foil to the double act of the younger older other Doctors. Within and around this momentous personal development for the Doctor, there's a pretty terrific monster of the week plot going on. If you took the stuff with UNIT, Queen Elizabeth I and the Zygons and put it into a 45 minute episode, it would be the stuff that makes series highlights. 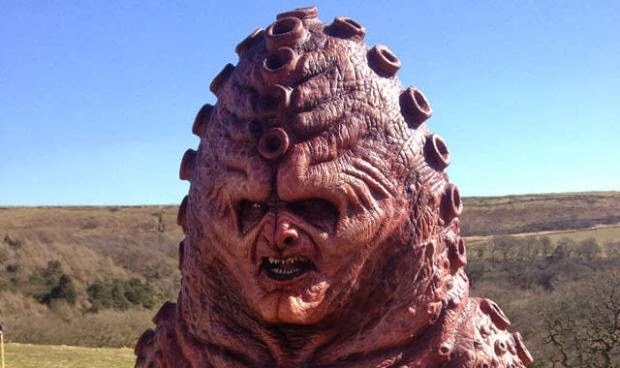 The Zygons, reappearing in glorious orange rubber for the first time since 1975, are the most effectively delivered creatures that the series has given us for a while- funny, frightening and fucked up. We're promised that they'll be back for an episode of their own in next year's series, and that's already up there on my list of things I can't wait to see in the next Doctor's run. UNIT's return is very welcome too. Kate Stewart was superb in last year's The Power Of Three, and Jemma Redgrave continues in the tradition of friends in UNIT, but I really loved Ingrid Oliver as the fangirlish Osgood. I'm really hoping they bring her back in the next UNIT story too, because aside from being bloody adorable, she'd be brilliant as a companion sometime in the future- different from the kind we've seen, all asthmatic and nervous, but with real potential to grow as a character. At this point, I wouldn't mind these UNIT members resuming their role as regulars, instead of more appearances from the Paternoster Gang. It feels right to include a monster of the week plot in the midst of a game-changing uber-special, because it celebrates the format as well as pushing forward with the future direction of the series. The restoration of Gallifrey is pure fanwank, but it's delivered with all the enthusiasm and vigour that characterises the series in the 21st century, and opens up all kinds of possibilities for the next series. The final shot, of the Eleventh Doctor's dream of finding Gallifrey amongst all of his previous selves, is a surprisingly moving, punch-the-air moment, with Smith nailing the monologue that accompanies it. On top of all of that, it's the funniest episode of Doctor Who we've had in a while. Moffat, who cut his teeth writing Coupling and Press Gang, has always wrote gags into his scripts, but the hit rate is seldom higher than it is here- the standout scene involves the three Doctors coming up with a very arsey and clever way to get through a door that turns out to be unlocked, and Clara's consternation as she just opens it for them. But the major kudos must go to Nick Hurran- having previously directed episodes like The Girl Who Waited and The God Complex with panache, his gorgeous work here brings an inherently convoluted script up to a cinematic standard. He even makes the 3D look good! 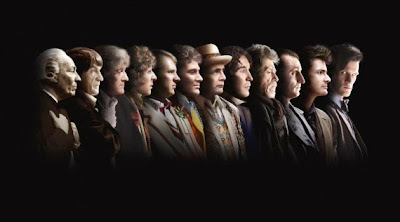 Like many fans, I saw The Day of the Doctor in the cinema, at a sold-out screening that was simulcast around the world in 94 different countries. Sometimes it seems like the more pedantic, number-crunching fans need to be reminded that there is a global appreciation for Doctor Who, and the cinema experience was the most purely enjoyable experience I've ever had as a fan. Thank Christ the episode turned out to be good then- somehow, an episode whose main concern is to recap and underwrite the last eight years of continuity is also one of the funniest, most exciting and most enjoyable additions to the expansive canon. 50 more years! 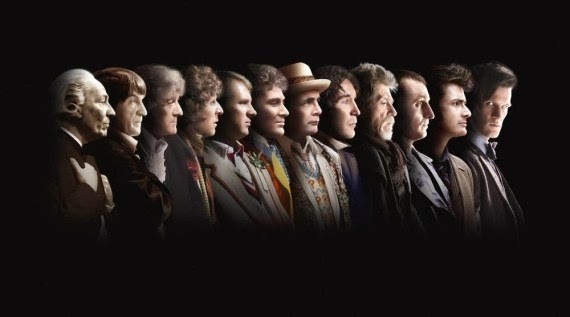 If you've seen The Day of the Doctor, why not share your comments below? 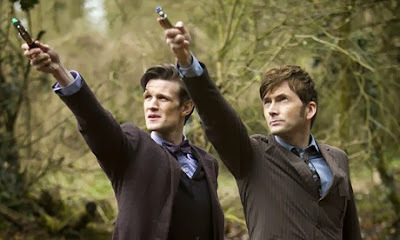 ‘It looks like you’re trying to end a time war.